Construction paper, any colour. You should have 24 cards for a group of 8 people, more if you have groups of 10 or more people. 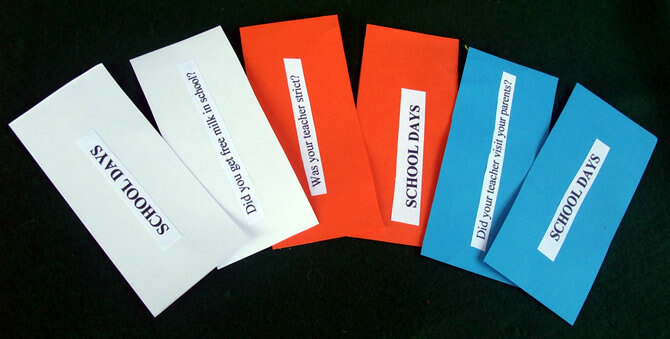 Download the supplied 'School Day' questions or type and print your own questions. To make your own, use Times New Roman font size 20 or larger. For each question, also type the game topic (j.e. 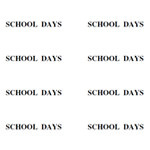 School Days) in a slightly larger font size (24 or larger). Ask participants to cut out all questions and game headings into strips as per photos. Divide cardstock with a black marker and give to participants to cut. The ones in the photo are 6 inches x 2 inches (15 cm X 5 cm). You may have them slightly smaller or larger, it doesn't matter. Ask participants to glue questions to one side of each card and game headings to the other side, sa per photos. Laminating the cards is optional. Deal one card to each participant which is to be placed in front of them with the question facing down. Ask the first participant to read his card and answer the question. If they don't know or it does not apply to them, other participants may answer the question. Allow a few minutes for the rest of the group to comment and tell slightly different stories. Go on to the second person until all have had a turn, then collect the cards and deal new ones. After the game ask participants if they know any songs or poems about the topic. For example, for World Teachers' Day read them a poem about teachers. Check if participants remember the 1970s song 'Another Brick in the Wall', give them a copy of the lyrics and sing together. Get a couple of nurses to join the group for a few minutes and sing together. 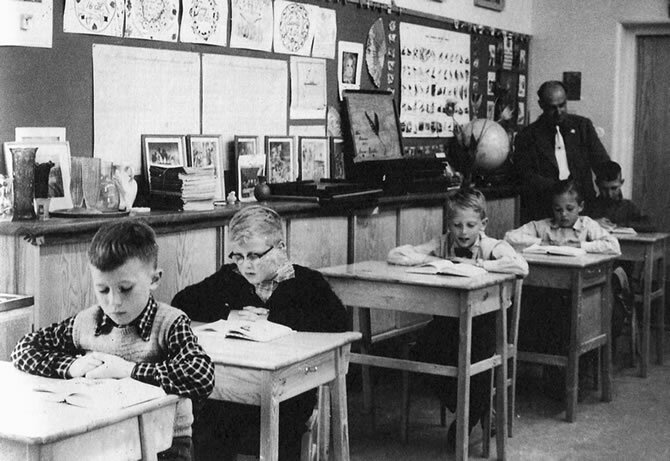 Was the cane used in your school? What did you call your teacher? Did you have class photos taken? Did you use pencil or pen to write? Did you have to sit for exams? Were you ever in the Principal's office? How did you learn your Time Tables? Were there 'bullies' in your school? Did you have a lot of homework? Did you like your teachers? What sort of lunch did you take to school? Did you wear shoes and socks to school? Did you have to pray before class started? Did you lift your hand up to speak? Did you go on field trips (excursions)? Did your teacher visit your parents? Did you have to learn poems? Did you have a sandpit in the school yard? Did you get free milk in school? 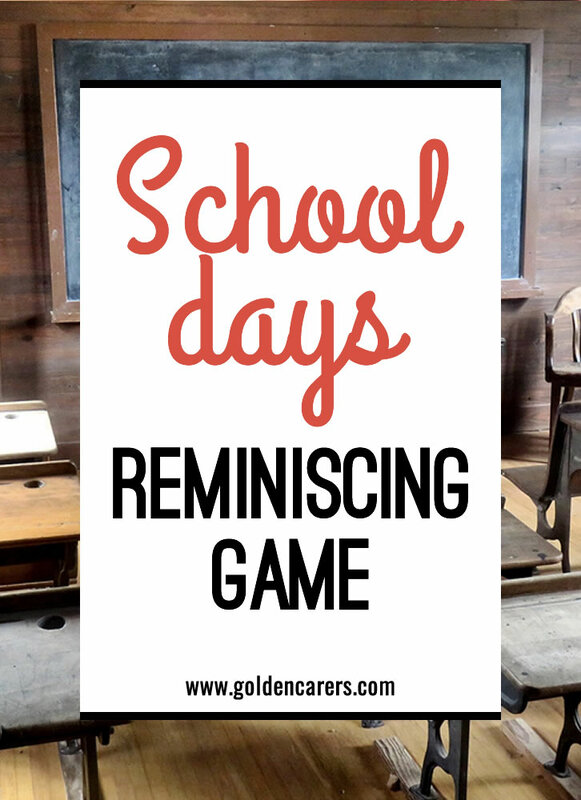 The played School Days at my mom's assisted living center and the residents just loved it. They didn't need much help, they just set around the big table and talked for hours. It was so much fun to hear their stories. Thank you so much for your feedback Nancy! Tried this with our residents and they really enjoyed it. That's lovely to hear, thanks for letting us know Angela! Just tries this as a last minute things. Was asked to do reminiscing for the activity director and don't wanna just look through the newspaper or magazine trying to come up with something. So I googled up and this was my first stop. Used what I had on hand to so the cards. Just cut the manilla folders and used a color marker for the letters. In 25mins. I was done and I have to say that the residents loved it. One resident who doesn't normally come to activities heard all the fun and questions that were going on and had to come see and joined us. The stories that came with those questions where hilarious. They really enjoyed it. Can't wait til next week. Were trying another theme. Thanks again. Thanks so much for your feedback Latricia, this is so lovely to hear! Thanks so much for your feedback Luiza, that's lovely to hear! I did this activity with my residents on Monday. Three ladies helped me cut the card and questions and happily stuck down with the glue whilst having humerous chat. We then went into the lounge and everyone took part in answering the questions about their school days and I let my residents know about my stories too. The activity was popular with us all. We had a wonderful time with this activity. It turned into a times table quiz and I was amazed how good they were. Thanks for the feedback Gaylene! Thank you so much for your feedback Satomi - I'm so glad you found the cards helpful. Me again we made and played the school days, everyone loved it even the staff joined in, we then made "Jobs for Us" and also have now made "Our Lives", it is a great reminiscing tool and creates lots of interaction. You could do similar with "going to work"
Our clients enjoyed this today, it was so funny & truly a morning we will not forget for a long time! Certainly was making memories! What a lovely morning we had reminiscing about the old school days - it took us on such a wonderful journey. Would this be suitable for dementia residents, as I find too many questions confuse them. If someone has tried this out with success, please reply. I tried this with my Men Group and usually they just sit there. This idea got them chatting immensely. Hi Shirley, I hope your clients have as much fun as mine.